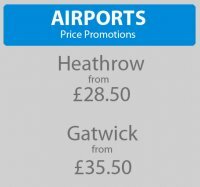 Meet & Greet Service – If you would like to arrange for a friend or business colleague to be picked up from Heathrow, Gatwick, Luton, Stansted or London City Airport, we can provide a meet and greet service so they will not be left wandering around the arrivals lounge or short-term car park looking for their minicab. No Charge for Flight Delays – Book one of our Wimbledon minicabs for an airport run and we will not charge any extra in the event that your flight is delayed. ETA Pick-Up Times – There is nothing worse than waiting for an overdue minicab, especially if you need to be somewhere in a hurry. We offer an ETA pick-up time of around 15-20 minutes to all of our customers. Polite & Helpful Drivers – We only work with drivers who share our enthusiasm for doing whatever it takes to make our customers happy so you can look forward to a polite and helpful service whenever you travel with Cascade Cars. Company Accounts – We welcome account customers, both private and corporate, and our citywide service will ensure that no matter when or where you may need a minicab, you can always rely on us to be there. Rapid Response – Although we always advise customers to book in advance, especially for airport transfers and other important journeys, you will be glad to know that our average response time for immediate bookings is just 20 minutes! Minibus Hire Service – If you are travelling in a large group, please call to ask for details of our minibus hire service. To book a minicab in Wimbledon or any other part of the city, call now on 0208 254 1395. Alternatively, we also provide online, smart phone and email booking services if you prefer. Whichever method you choose, we look forward to welcoming you as a new customer in the very near future. Book your minicabs now from Cascade Cars, we have minicabs operating in London 24 hours a day. Cascade Cars are available 365 days a year, all Cascade Cars minicab vehicles are kept immaculately clean inside & out, and the drivers are always well presented, polite and extremely helpful. Call Now On 0208 254 1395 And Book With Cascade Cars Now. Cascade Cars minicab service offer an extremely professional level of service to our clients. We pay particular attention to detail on driver training, health & safety, the environment and corporate social responsibility matters. We have both the resources and experience to provide the complete transport solution. Cascade Cars minicab service provide saloon cars, executive cars, estate cars 6,7,8 seaters mpv vehicles as well as wheelchair accessible minibus. Cascade Cars minicab service provide local and long distance minicabs whether it is taken from either a theatre, hotel, train stations, nightclub, restaurant or just visiting your friends. Cascade Cars minicab service advise clients to pre-book but our average response time is 20 miniutes. Cascade Cars Minicabs All Over London.